Killer Characters: A visit from Lori Briggs--and a cover reveal! A visit from Lori Briggs--and a cover reveal! Lori Briggs here, taking time from my duties as the First Lady—of East Aurora, NY, anyway—to say a little about Liz McCall. And Ken Young, our chief of police. See, Liz would be surprised to hear me say this, but I was really rooting for their fledgling relationship to work. After all, a good police department is very important, even to a sleepy village like ours, and it wouldn’t have hurt to see the chief plant a few roots by marrying a local. Well, if you’re unaware of recent events (in Murder on the Toy Town Express) I’m not one to gossip. I will admit that I’m with most of the rest of the town to say that Marya coming back into Ken’s life was an unwelcome surprised. For Liz. And I think for Ken, too. Not quite sure what he sees in that Barbie wannabe, but I’m keeping an eye on it. I suspect there’s more to her than you can see on the outside. Like one of those Russian matryoshka dolls. You crack that chick open, and I expect you’ll see a few different layers—each one more rotten than the last—and ones I’m going to bet she doesn’t want anyone to know about! And I might just make it my New Year’s resolution to get to the bottom of it! 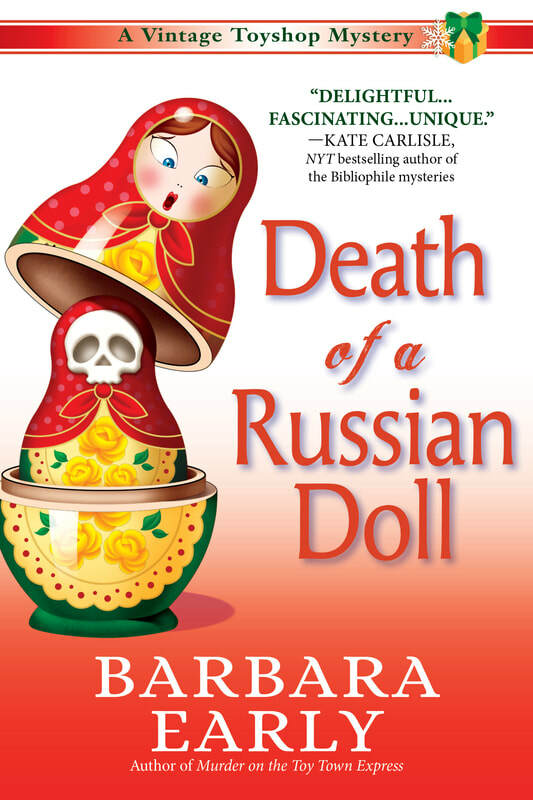 Look for DEATH OF A RUSSIAN DOLL, coming October 2018. It is going to be hard to wait until October to read this book! Your book sounds like great fun. Looking forward to it. Oh my - OCTOBER???? Can't wait! But. . . October!!!! That's so far away!! !